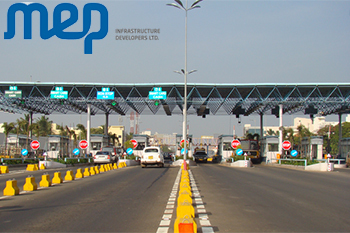 MEP Infrastructure Developers Ltd has received the Letter of Acceptance (LOA) from National Highways Authority of India (NHAI) informing that MEP has been engaged as the Contractor for the Project of "Collection of user fee through Fee Collection Agency on the basis of competitive Bidding for Paduna Toll Plaza. MEP Infrastructure Developers Ltd has received the Letter of Acceptance (LOA) from National Highways Authority of India (NHAI) informing that MEP has been engaged as the Contractor for the Project of "Collection of user fee through Fee Collection Agency on the basis of competitive Bidding for Paduna Toll Plaza at Km. 311.100 for the section Km. 278.000 to Km. 348.000 [Udaipur- Kherwada] of NH No. 8 in the State of Rajasthan". Speaking on the occasion, Jayant D. Mhaiskar, Vice Chairman & Managing Director, MEP Infrastructure Developers Ltd. said that “MEP has been successful in retaining Paduna Toll Plaza for the 3rd time in a row from NHAI and this is the maiden one year toll award in this fiscal. MEP has recently also bagged 4 projects under BOT Hybrid Annuity Model from NHAI and MORTH with an order book of Rs.2,589.26 Crores for Hybrid Annuity. We are happy to have a promising start of this financial year 2016-17” Mr. Mhaiskar added. MEP Infrastructure Developers Ltd ended at Rs. 41.25, down by Rs. 0.6 or 1.43% from its previous closing of Rs. 41.85 on the BSE. The scrip opened at Rs. 42 and touched a high and low of Rs. 42.5 and Rs. 41 respectively. A total of 84434(NSE+BSE) shares were traded on the counter. The current market cap of the company is Rs. 680.35 crore. The BSE group 'B' stock of face value Rs. 10 touched a 52 week high of Rs. 67 on 17-Jul-2015 and a 52 week low of Rs. 34.2 on 12-Feb-2016. Last one week high and low of the scrip stood at Rs. 46.4 and Rs. 41.6 respectively.